Bright Yellow Softball Silver Earrings with Fish Hook - Softball & Baseball Jewelry, etc. These stylish Silver-Tone Fishhook wire Yellow Softball Ear Rings feature a suspended Bright Yellow enamel Softball. 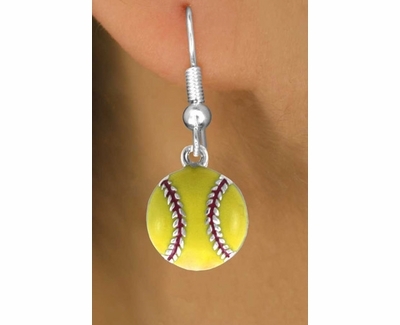 A perfect gift for any female Softball player... or buy a pair for yourself! Round Softball Earring pendant measures about 1/2" Dia. - with Surgical Steel Fishhook. I love these earrings...they are made good at a great price!!! I have had lots of compliments every time I wear them!